Uttarakhand Board of School Education (UBSE) conducts examinations of 10th and 12th class every year. 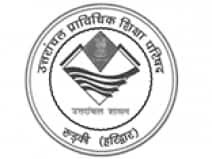 Uttarakhand Board 10th Exam 2019 and Uttarakhand Board 12th Exam 2019 will be held in the month of March. Every year, approximately 1.5 lakh students take up 10th school exam and around 1.3 lakh students take up 12th exam. The Class 12 board exam started from March 5 and ended on 24 March and Class 10 exams were held from March 6 to March 24. In 2018, Around 78.97 per cent students have passed the examinations in Class 12 while in Class 10 around 74.57 per cent students declared successful. Kajal Prajapati, of Khatima Uddhamsingh Nagar, had topped Class 10 with 98.40 per cent. She was followed by Rohit Chand Joshi (98 per cent) and Jatin Pushpan (97.80 per cent). Last year's topper was Divyanshi Raj who had scored 98.4 per cent. In 2019 Uttarakhand Board will declare the 10th and 12th exam result in the month of May. Students can check the results of the Uttarakhand Board 10th and 12th examination on www.livehindustan.com. Apart from this, the results can be checked on the official website of the Board.